The BBC reports that Siegfried Sassoon‘s diaries from the First World War have been digitised by Cambridge University Library and are now available online (more illustrated reports here and here). 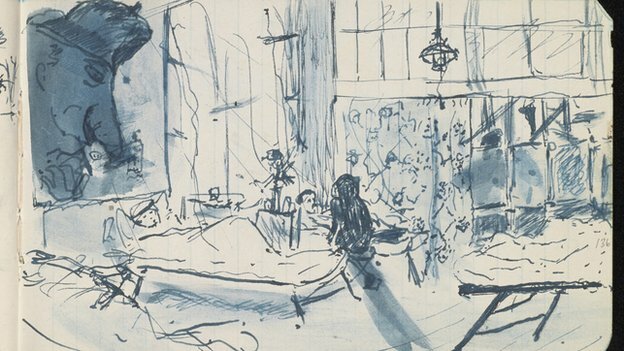 The journals and two notebooks of poetry include not only Sassoon’s jottings but also sketches like the interior of a military hospital (above). Unlike edited printed transcriptions, the digitisations allow the viewer to form a thorough sense of the nature of the physical documents. Sassoon wrote in a small but neat and legible hand, frequently using the notebooks from both ends. 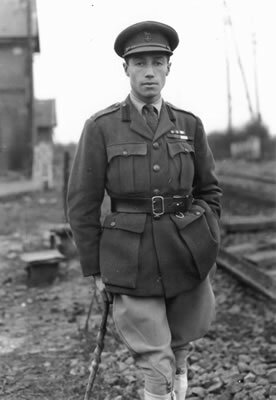 His war journals were used for a wide variety of purposes: in addition to making diary entries Sassoon drafted poetry, made pencil or ink sketches, listed of members of his battalion and their fates, made notes on military briefings and diagrams of trenches, listed locations and dates of times spent at or near the Front, noted quotations, and transcribed letters. The wartime notebooks were small enough to have been carried by Sassoon in the pocket of his Army tunic, and many had enclosures such as letters tucked into the outer cover or inner pouches; some bear tangible evidence of use in the trenches, from the mud on notebook MS Add.9852/1/7 to the candlewax spilled on MS Add.9852/1/9, presumably as Sassoon sat writing in his dug-out by candlelight. The journals give a fascinating insight into daily life in the trenches. Sassoon records for example the first day of the Somme (‘a sunlit picture of Hell’; MS Add.9852/1/7, folios 10r-12v) and the moment when he was shot by a sniper at the Battle of Arras (MS Add.9852/1/10, folios 6v-9r), along with manuscript drafts and fair copies of his ‘Soldier’s Declaration’ (MS Add.9852/1/10, folio 45v-46r; MS Add.9852/1/11, folio 21-23). His drawings from France range from studies of towns and churches (MS Add.9852/1/5, folio 36v; MS Add.9852/1/9, folio 8v) to a psychological profile of ‘the soul of an officer’ (MS Add.9852/1/7, folio 3r). The poems include previously unpublished material along with early drafts of some of his best known works, including an early version of ‘The Dug-Out’ with an additional, excised verse: MS Add.9852/6/2, folio 76r). This entry was posted in poetry, World War I and tagged Siegfried Sassoon, war diaries, Western Front by Derek Gregory. Bookmark the permalink.